Crown moulding installations demand precise craftsmanship and represent a variety of challenges. The following guide requires skills demanded in any millwork installation, whether it's a chair rail, baseboard, window treatment, door trim, stair tread bracket or decorative medallion. Moulding installations run most smoothly when each member of the building team anticipates and addresses all elements and potential problems from the beginning. All parties should have drawings and specifications at the earliest stage possible. Check the specifications to figure the perimeter of each room and determine how many linear feet of moulding you will need. When ordering millwork, always add about two extra inches of moulding for each corner to compensate for any woodworking errors made during finishing or installation. Millwork installation is normally one of the last steps in construction. Millwork orders should be placed at least six to eight weeks in advance. Be aware that the building team will have to agree upon, then choose, inspect and approve material samples before placing an order. When framing begins, document the precise locations of plumbing rough-ins, electrical and communications outlets, air grills and other obstructions that will affect the installation. Make any low-cost modifications before the walls go up. Identify stud locations: Identify stud locations, wall and door frames, and ceiling heights so that holes can be pre-drilled before moulding installation. Determine the number of inside and outside corners to identify the cuts you'll need to make (see Tables A and B). Also, walls are not always squared and true. Each corner will require you to measure the wall angles and figure the proper cutting angle. To do this, place a piece of moulding against the wall at each corner. Work with a small piece of moulding to easily see the angle and measure using a protractor. All angles will have a corresponding setting on your miter saw and the most common angles are detailed in Tables A and B. 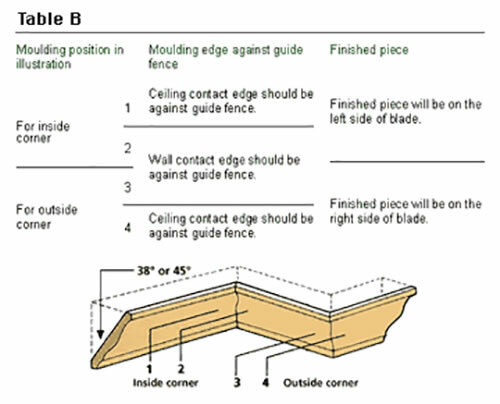 When cutting mouldings on a compound sliding miter saw, set the angles as directed in Table A and position the mouldings on the top surface of the saw base as indicated in Table B. 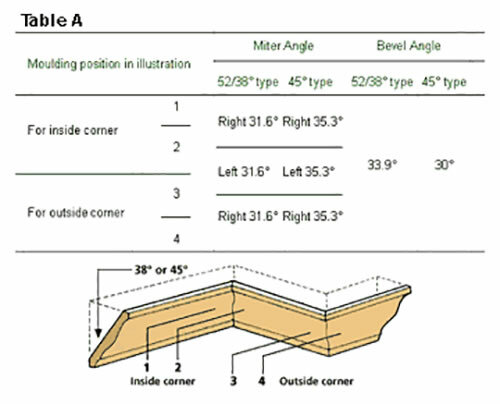 As shown in Tables A and B, there are two primary miter and bevel angle styles if the wall is a true 90-degree angle. Your installation angle is dependent on the size and shape of the moulding. It is easiest to cut all mouldings on a sliding compound miter saw, placing the crown moulding with the broad back surface down on the turn base and setting the saw to the proper angle. If you use a standard miter saw, turn the moulding upside down and set it at an angle between the fence and the table. When making a cut, make sure the blade has stopped rotating before lifting it from the sawn millwork. Do not raise the blade while it is still rotating or the moulding will catch in the blade and become damaged. In addition, when pressing down the handle, apply pressure parallel with the blade. A force perpendicular to the turn base or a change in the pressure direction during a cut will impair the precision of that cut. Beautiful miters accent the details of hardwood moulding, but crown blocks and other alternatives can eliminate the need to miter while still adding character to the trim. Crown blocks come as perfectly finished corners and make it easy to work on ceilings that have uneven lines. Use rosettes and plinth blocks around door and window frames, and base blocks to finish the inside and outside corners of baseboards. Once properly cut and finished, the millwork is ready for installation. Pre-drill nail holes in all mouldings to avoid injuring the finish. Before nailing, apply construction adhesive to the mouldings where they will meet the wall and use wood glue in the mitered corners. Immediately wipe clean any glue that has seeped onto the finished moulding, wall or ceiling. Hold the moulding in place to give adhesives time to set. Then complete the installation by nailing the mouldings securely to the studs with a nail gun. If a moulding has dentil and embossing, match the dentil first and let the embossing match as well as possible. Even the most skilled carpenter can occasionally make a cutting, finishing or installation mistake during woodworking. Here are a few tips for correcting nicks, dents and other woodworking blemishes. Sometimes, you may damage a piece of moulding with a hammer ding or dent, but it's difficult to get wood filler to stick to a very small blemish. To help give the filler an anchor, drill a couple of shallow holes in the dent with a 1/16" bit. These small holes will help the wood filler stay in place so that it covers up the blemish. Retouch all flaws with the matching stain. If a slip of the saw damages an angled piece of moulding, compensate by making a clean cut on the inside of the defect. That's why specifying extra moulding in the planning stages is important. After attaining the proper angle, cut the moulding to fit by trimming the opposite end. 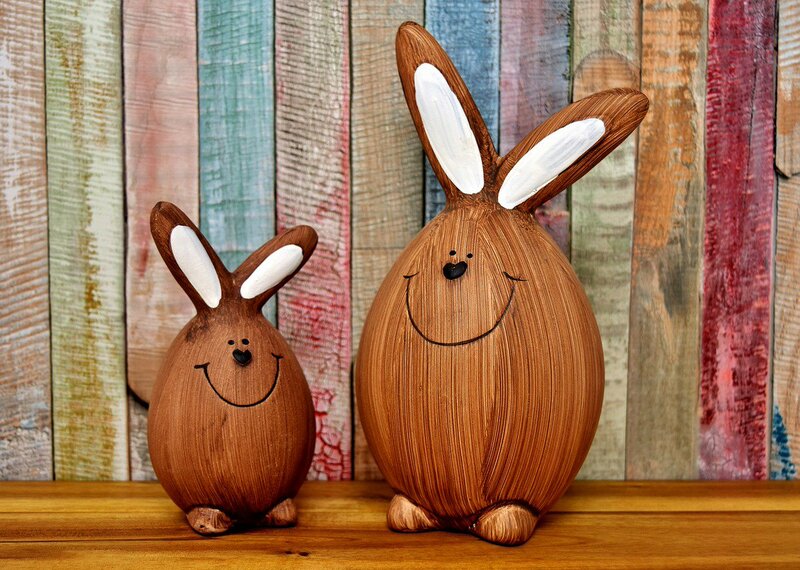 Never throw any wood away. Keep a scrap bin for large pieces and a milk jug for smaller bits and pieces. Scrap wood pieces often come in handy for decorative matching, contrasting parts, and/or screw plugs. Technical assistance and/or photos provided by: Ornamental Mouldings, Archdale, N.C.; White River Woodworks, Fayetteville, Ark.